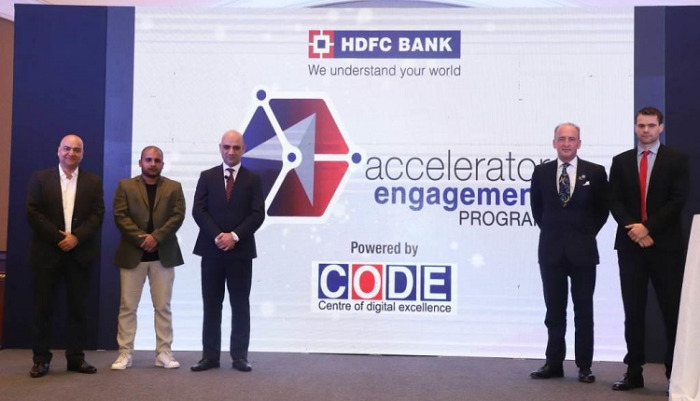 HDFC Bank announced the launch of its Accelerator Engagement Programme (AEP). In this first-of-its-kind programme, HDFC Bank will partner with leading start-up accelerators from across the world to gain early access to over 30,000 fintech ideas and innovative solutions. Start-up accelerators are organisations that help early-stage companies develop their product and business model, and also connect with investors. The bank will focus on those working in the area of artificial intelligence (AI), machine learning (ML), analytics, and robotic process automation. In the first phase, the Bank launched the programme in association with the United Kingdom’s Department for International Trade (UK DIT) and start-up accelerators 91springboard and IvyCamp. AEP was launched in Mumbai by Mr. Nitin Chugh, Country Head – Digital Banking, HDFC Bank in the presence of Mr. Ben Green, First Secretary, Trade, DIT; Lord Mayor of the City of London, Alderman Charles Bowman; Mr. Mithun Shetty, Head of Community Building at 91springboard; and Mr. Vikram Gupta, Founder and Managing Partner, IvyCap. “We are excited to take our engagements with fintech start-ups global with the Accelerator Engagement Programme. At HDFC Bank, we are looking for disruptive, global first innovations. This enables us to be in sync with our customers’ needs and desires and become part of their lifestyle. We believe that we need to work as a partner in the digital eco-system and encourage the spirit of innovation in the country. This is a win-win for all of us,” said Mr. Nitin Chugh, Country Head – Digital Banking, HDFC Bank. “I am delighted to help launch this powerful new initiative, and even happier that the delegation I’ve brought to India is the first to benefit from it. Fintech is an area of immense potential for the UK and India, and I look forward to seeing more collaboration between our two countries in this area,” said Lord Mayor of London, Charles Bowman. 91SpringBoard engages with more than 25,000 start-ups and fintechs globally while IvyCamp is engaged with more than 5,000. AEP is part of HDFC Bank’s Centre of Digital Excellence, where the objective is to create a mutually beneficial ecosystem with relevant players in the start-up space. Other initiatives include a Digital Command Centre and ‘Industry Academia’, which aims at mentoring and hand-holding fintechs and start-ups incubated at country’s top technical and B-schools. The Bank also organises Digital Innovation Summit, an annual event to identify path-breaking fintech solutions.